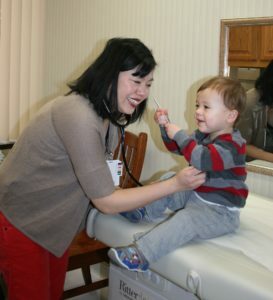 "If you're looking for a pediatrician, look no further! He has been accurate in his diagnoses, patient in answering questions, and professional in promptly calling us if we had had questions. Our daughter was afraid to go to the pediatrician's office prior to going to Dr. McGonnell. He took the time to develop a friendship with her. Now she enjoys going for well and sick visits." An early follow-up is recommended within 2-3 days after you leave the hospital with your baby to check the baby’s weight and check for jaundice. The next well visits are at 2 weeks, 1 month, 2 months, 4 months, 6 months, 9 months, 12 months, 15 months, 18 months, 24 months, 30 months. From 3 years of age, well visits should be scheduled annually until age 18 years. Well visits are very important to your child’s well-being. 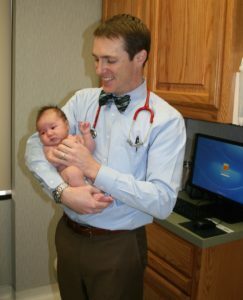 They give you the opportunity of getting to know your child’s pediatrician and for the doctor to get to know you and your child and assess her growth, development, and general health. Your child’s development will be assessed at each well visit in the first 5 years of life. When children are ill, it is much harder to assess their developmental and social skills. They usually do not want to show off their new walking skills nor do they relate as well to the doctor as they do when they are feeling well. That is why a sick appointment for an ear infection is not a replacement for a well visit. Pleases read about our immunization policy. Until your child is able to answer questions on his own, all questions about him will be directed to you. As your child is able to answer questions, we will start talking to him directly so that he learns we are his doctor and want to hear from him as well as from his parents. We will ask both the patient and the parents for their input from school age until adolescence. Starting in adolescence, we will ask parents for any concerns but we will also request time to speak to your teenager privately. Usually, for the first 6 months of life, the baby has no stranger anxiety and can easily be examined on the examination table. 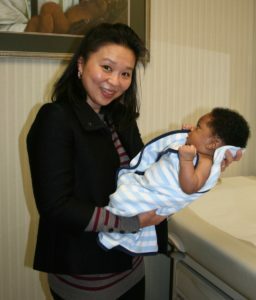 From the 9-month to the 18-month visit, we will often examine the baby on the parent’s lap to minimize stranger anxiety and resistance to the exam. Often, by age 2 or 3 years, the child feels more comfortable and is less scared of the exam. Usually, by age 4, the child will feel comfortable sitting on the exam table by herself. At every well visit, the child will be weighed and measured. For the first two years of life, the head circumference will also be measured. For the first two years of life, the child will be measured lying down. After age 2, your child will usually be measured standing up. There are some small variations between a lying length and a standing height that can occasionally cause a decrease in the number from the last length to the first standing height. Don’t worry, this does not mean your child has shrunk. In the newborn period, your child’s weight usually changes day to day and small measurements such as a few ounces are very important. There may be differences between the office scale and a scale you may have at home. The weight trend over time is much more important than any weight measurement on a particular day. Your baby’s head grows faster in the first 2 years of life than any time thereafter. Her head size and rate of head growth are important to monitor to ensure normal growth and development of the brain and skull. At each well visit, your child’s weight, height and head circumference (first 2 years only for head size) are measured and compared to normal values for children of the same age and gender by plotting the measurements on standardized growth charts, such as those of the Centers for Disease Control. Monitoring your child’s growth is one of the most important parts of the well visit. Each child grows differently, but steady growth is important. A short child who is steadily growing and following a curve of a lower percentile is not worrisome, but a child who suddenly stops growing or moves to a much lower percentile suddenly can be cause for concern. By following the trends of your child’s growth over a number of months, the normal slow periods of growth tend to even out with the spurts. 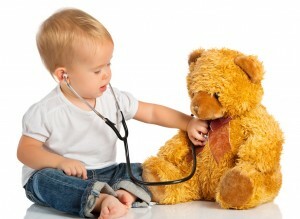 The pediatrician will begin the exam by making a general assessment of your child’s appearance and health. The order of the physical exam differs with age. With babies, your doctor will usually start with listening to the heart and lungs while the child is quiet and will try to save the ear and mouth exam for last since they are usually the least cooperative with these parts. As the child is older and more cooperative, the doctor may proceed in a head to toe fashion. We begin taking blood pressure measurements in the office at age 3. Normal values for blood pressure vary with age and height. Normal blood pressures for children are lower than for adults. Anxiety, crying, coughing, and struggling can all cause the blood pressure to be elevated. Often the automatic blood pressure cuffs read the blood pressure as high. If the automatic blood pressure reads high, we will generally repeat the measurement with a manual cuff. High blood pressure or hypertension is less common in children than adults, but it can happen. While it can happen for a variety of reasons, the most common in childhood is kidney disease. If the blood pressure is high even with a manual reading, we will probably request that follow-up blood pressures be done over a few weeks. For school age children, we usually request this be done in the school nurse’s office to minimize “white coat hypertension,” which is when the patient has hypertension due to the anxiety of being at the doctor’s office but is normal when taken in other places. Upon examination of a child under 2, the doctor will check the “soft spots” of the skull, which are called fontanels. These are areas where the skull bones have not grown together yet to form a full protective cover for the brain. There are two fontanels that may be open at birth, the posterior and anterior. The posterior (located on the back of the head) is triangular, may be closed at birth, and usually closes within the first 2 months of life. The anterior fontanel on the top of the head is diamond-shaped and usually closes by 18 months of age. The fontanels are important to allow for the rapid brain and skull growth that normally occur in the first 2 years of life. The doctor will also check the shape of your child’s head. Since the AAP recommendation to place babies on their backs of over 20 years ago, we frequently see babies with flattening of the back part of the skull. We encourage tummy time frequently during the day to counteract this effect on the back on the baby’s skull. It is best to avoid putting the baby in the car seat or swing too often, as the pressure of the seat on the back of the head usually has the same effect. Your pediatrician will check your child’s ears for infection or fluid behind the eardrum. Ear infections are very common in young children, particularly from 6 months through 3 years. While most ear infections cause pain, fever, or prolonged cold symptoms such as a cough or a runny nose, sometimes babies develop ear infections without apparent symptoms. Undiagnosed persistent ear infections can cause problems for hearing and speech development in infants and young children. Your doctor will check to make sure a silent ear infection does not go undetected. If you have any concerns about your child’s hearing, be sure to let your doctor know about them. Even when your baby had a normal hearing test at birth, hearing loss can sometimes be detected later and can be due to ear infections or loud noise exposure. Parents are often the first to notice hearing problems. Please let us know if you are worried about your child’s hearing. Please do not worry about earwax, which is a normal lubricant of the ear canal. Earwax can sometimes be a problem for the physician because it obscures the eardrum. The physician will sometimes need to carefully remove the earwax in order to see the eardrum. We do not recommend parents try to clean inside the ear because the canal can be injured and it usually only causes the wax to be pushed further into the canal. Your physician will use a lighted instrument called an ophthalmoscope to examine your child’s eyes. We look for problems inside the eye such as cataracts or tumors. We also check for any misalignment of the eyes or excessive tearing. We offer cutting edge technology vision tests in our office called the Spot Vision test and the Visual Evoked Potential. Please see the Recommendations for Vision Screening on our website, which goes over these tests in detail. If any of these tests are abnormal, we do refer to a pediatric ophthalmologist for evaluation. Your pediatrician will examine your child’s nose for signs of allergy or infection. We will also check the back of your child’s throat for enlarged tonsils or signs of infection. We examine the teeth and gums as well, but this is no substitute for the dental visit. We recommend that dental examination starts after the first birthday with a pediatric dentist. We have a list of pediatric dentists in the area we recommend. Your pediatrician will check your child’s range of neck motion as well as feeling for any lumps, which can be enlarged lymph nodes or an enlarged thyroid gland. Swollen lymph nodes in the back of the neck often occur with a scalp infection. Swollen lymph nodes in the front of the neck are frequently seen with tonsillitis. Your pediatrician will look, listen, and feel during the chest and lung exam, observing the rate and quality of breathing, then using the stethoscope to listen for breath sounds. The stethoscope is used to listen for normal or abnormal heart sounds. Many children have heart murmurs, but most of these are called innocent murmurs, meaning there is no problem in the heart causing this extra sound. We often will just observe these murmurs, but if they are persistent, we may refer to cardiology for an evaluation to ensure there is nothing wrong. If the murmur is unusual or very loud, we may refer to the cardiologist right away. Your pediatrician will check for any masses or enlargement of the liver or spleen by percussing on the abdomen or tapping to detect differences in sound. We then will press down gently on the abdomen to make sure we do not palpate any masses or enlargement of organs. The abdominal exam may be difficult for ticklish preschoolers or school age children to lie still without giggling. Your pediatrician will routinely check the genital area for rashes and to look for any signs of sexual maturation. For boys, the testes are palpated to ensure they have fully descended and that there are no masses. When the doctor checks your child’s reflexes, he is looking for any problems with the nervous system. Tests of coordination and muscle strength are combined with the developmental assessment to look for any diseases of the nervous system. Your pediatrician will check for different skeletal issues at different ages. At early well-child visits, we check to make sure your child does not have any problem with dislocated or dislocatable hip joints. Sports injuries are the most frequent cause of bone and joint problems of older children. The next most common skeletal problem your pediatrician checks for is scoliosis, with is a linear curvature of the spine. Schools frequently screen for scoliosis and may send home a note to parents to have the physician check. Scoliosis is more common in girls and can be progressive. If it is diagnosed and even if it is mild with no treatment needed, the orthopedist will usually follow the patient periodically to ensure it is not worsening. At each visit, the pediatrician will check your child’s skin for rashes, birthmarks, bruising, infection, or changes in moles. The skin can provide the first clue of an illness such as leukemia or some neurologic disorders. In the teen years, acne may be a serious concern of your adolescent. We can manage mild to moderate acne in our office, but if it is severe, we may refer your child to dermatology. Your doctor will be monitoring your child’s development at each well visit and will assess this mostly by your report on surveys that you are able to fill out up to a week before the visit. Developmental areas that are assessed include gross motor (sitting, crawling, standing, walking), fine motor (pincer grasp, coloring), language, which includes expressive (speech) and receptive (understanding). If a problem is noted, we may refer your child to ECI or Early Childhood Intervention for evaluation. The well visits are an opportunity to talk with the pediatrician about your concerns or to ask advice about parenting or developmental questions. We look forward to seeing you in the office with your child at her next well visit.